It's that time of year again! The new year us right around the corner and people are starting to consider resolutions for the new year. For every person making a list of resolutions, there is likely another person cursing the activity for it's fruitlessness. It's easy to skip out on them, or to make a resolution to lose weight or be more active, or some other general resolution of improvement. But it's also super easy to let those kind of resolutions go by the wayside due to their vagueness. Being vague never inspires anyone to action! Resolutions are usually too vague or too strict. Try re-framing the idea of making resolutions to setting goals for the new year. Goals are something you can work towards, and not need to achieve immediately and indefinitely. The more specific you can be, the more likely you are to work towards those goals. 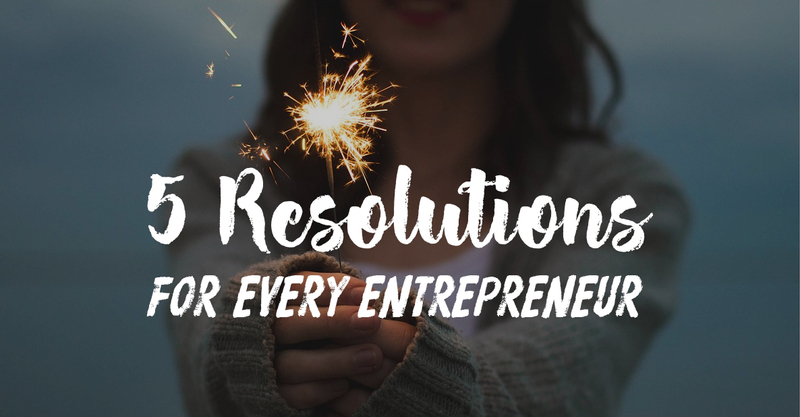 Not sure what kind of resolutions to make this year? Here are a few ideas that will help you re-focus for the new year, and encourage success! Does your work lifer and personal life balance need a little work? Entrepreneurs in particular have a rough time finding a good balance between yourselves, and our work selves. They seem to blend into one all too easily. It is so important for our health and happiness to find a balance between these two things. If you work from home you can start by creating a separate space for work. That way you can work, then close up shop! If you have limited space, check out our blog on creative home office ideas for small spaces. Take a good look at home much time you spend working on, thinking about, or stressing over work. Is it balanced with how much time you spend with your family or friends? Is it balanced with how much time you spend doing things that make you happy? It doesn't need to be 1:1, but it shouldn't be 1:100. A great thing you can do for yourself and your business is to keep up with the news, events, and updates in your industry. If you can keep on top of the news, you are setting yourself up for success! You can position yourself at the forefront of your industry by knowing what's new, what's working, and what's not first. Break out your old business plan. Take a look at it. Does it still represent your goals now? Does it reflect the direction you want your brand to go? It's time to give a good once over .. or twice over. Make updates where needed, or start from scratch. Do you not have a business plan? Put one together! If the idea of a business plan freaks you out, try creating a vision board for your brand and keep it nearby to remind you of what and where you want your brand to be. Consider attending events, conferences, and conventions in your industry. It's great to talk to people face to face and make connections. Dealing with a business online can often isolate you, but it doesn't have to! You should also consider increasing your brand's presence online. You should be talking to your customers, posting updates about your business, sharing events and sales, and interacting online. The more you put your brand out there, the more people will see you. Practicing self love and self care can do wonders for us in every aspect of life. All of us have different insecurities and different things we wish we could improve. Take some time for yourself to do things that make you feel relaxed, bring you joy, or make you feel productive in your life outside of work. This could be very different things for different people. It could be making sure you are active a few times a week, it could be treating yourself to some pampering, it could be going fishing on the weekends, it could be taking time to rediscover an old hobby. Make time for whatever it is that makes you feel good, and feel good about yourself. Create a list of small things I can do everyday to bring me joy, and do them! Do you have any goals or resolutions for the coming year? If so, share them down in the comments section below! We would love to hear what you have planned for 2017!